A55-acre, family oriented place with rolling hills, hiking trails and two large ponds for fishing, boating and a swimming beach. They offer primitive lots, full hook-ups and a lodge. Special event weekends including a Bluegrass Festival. This building was built in 1832 by Colonel Matthew Rogers, and is now listed on the National Register of Historic Places. Abraham Lincoln visited this building on many occasions during his travels between New Salem and Springfield. Now a museum, it houses audio narrated diorama about Lincoln’s connection to Athens, so viewers bring history to life with the touch of a button! Call before visiting. Built in 1844 is where Abraham Lincoln argued many cases. The museum features an extensive collection of antique firearms and Indian arrowheads. Originally built in 1872 and restored after being almost totally destroyed by a tornado. Nestled in the bluffs above the Sangamon River, the ranch offers miles of bike trails, horse trails and hiking. A 26-square tract located in the gentle rolling countryside. Activities include, hunting, fishing, boating, canoeing, hiking, biking, horseback riding, camping and more. A junction of the Sangamon and Illinois rivers. Site includes bottomland environment comprised of sloughs, backwater lakes, timbered ponds and bottomland timber making it an ultimate public duck hunting area accessed primarily by boat. Approximately one mile south of Greenview and 20 miles north of Springfield, is a treasured jewel in Menard County. The original house was built in 1850. Check back for special events! Downtown and other historic sites, follow in the steps of Abraham Lincoln through historic Jacksonville. See the actual places and hear the real stories of Lincoln as his friends and associates knew him while Looking For Lincoln in Jacksonville. These creative history stories are professionally recorded and interesting for visitors of all ages. Downtown, painters from all over the U.S. and as far away as Ireland and Australia worked on these 10 historical murals. They are located in various areas of downtown Jacksonville. Various Jacksonville locations, Jacksonville was one of the many stations along the Underground Railroad and one of the busiest during the mid-1800s. Prominent abolitionists like Edward Beecher, first president of Illinois College and brother to Harriet Beecher Stowe, author of Uncle Tom’s Cabin, Jonathan B. Turner and Benjamin Henderson, a former slave, were among the many that were relentless in the pursuit of freedom for all. Jacksonville has at least nine documented sites which were important to this endeavor during the years before the Civil War. Although most are private residences, many of the homes used in the Underground Railroad can still be seen in Jacksonville. Follow Morton Avenue east over Route 72, and follow the signs, the showcase homestead of Jacksonville’s extensive Underground Railroad network. Former slaves were ushered through this home on their way to freedom. Located in Duncan Park, this restored mansion was used for State business during the term of Governor Joseph Duncan from 1834-1838. The three-story, 17-room mansion was built in 1834. The mansion is owned and operated by the Rev. James Caldwell Chapter NSDAR. It was placed on the National Register of Historic Places in 1971, and houses many of the original Duncan family furnishings. Thomas Officer Hall, the museum has 2 floors of displays. Built in 1868, the Morgan County Courthouse is the center of government for the county. Live theater productions, performed at the Sophie Leschin Auditorium, The JTG Studio Theatre, and various locations. One of the top orchestras in the state, the JSS is on stage for five concerts each year. Auditioned performers work with featured guest performers, including members of the St. Louis Symphony. Programs include classical, holiday, and pop offerings. Visit this beautiful, historic structure, featuring monthly changing art exhibits and permanent collections which include displays of early Mississippian Native American pottery and the Miriam Cowgur Allen doll collection. Poet and author of The Spoon River Anthology, spent his early childhood in Petersburg, before moving on to spend his adult life in Chicago. In his honor, the memorabilia of his life and works are displayed in the house where he lived as a young boy. Take a break in the country, down a small road to the bluffs overlooking the Sangamon River. You’re sure to be pleased with what you find here. With over 20 theme gardens; a rustic barn shop featuring dried flowers, herbs and gifts; a greenhouse in the spring; group tours, picnics, bonfires and hayrides; beautiful Clydesdales; and garden weddings, this is quite a place to visit! This wonderful historic site is a reconstruction of the village where Abraham Lincoln spent his early adulthood. Lincoln’s time in New Salem formed a turning point in his career. He was a store clerk, rail splitter, postmaster, surveyor, and businessman. He also enlisted in the Black Hawk War during his time at New Salem, and was elected to the Illinois General Assembly in 1834 and 1836. Come and see for yourself, or take a virtual tour at our website! Lincoln’s New Salem Canoe Rental, Inc. Discover the natural settings of Lincoln’s New Salem, historic Petersburg and surrounding Menard County by canoe or kayak! You can travel the waters that Lincoln traveled as you take in the views of soaring wildlife around every bend. This old cemetery which dates back to the 1800’s, is the resting place of Lincoln’s first sweetheart, Ann Rutledge, along with many former New Salem residents. Rutledge’s tombstone bears an inscription written by Edgar Lee Masters, who is also buried nearby. Enjoy a historical tour around Petersburg on the Stier Trolley Express! Tours leave from the Visitors Center at New Salem State Historic Site. Tickets can be purchased at the Lincoln League Bookstore, just east of the Visitors Center. Please call for tour dates and times. Located on 48 acres in southern Menard County. Old trees in the forested areas date to about 1850. Guided tours are offered by appointment. A 475-seat outdoor amphitheater designed for your comfort, with auditorium style seating, concessions, and a multi-level stage. Performances are held Friday through Sunday, from mid June until late August. Call or visit our website for more information. The centerpiece of Clayville is the Broadwell Inn, the oldest brick building in Sangamon County, built in 1824 by the Broadwell family as a stage coach stop between Springfield and Beardstown. The Inn is listed on the National Register of Historic Places. It is surrounded by numerous other historic buildings from Central Illinois moved to Clayville in the 1960’s to recreate an early frontier pioneer village. Come see a unique piece of Illinois history. The first and only museum dedicated to preserving and interpreting the nation’s history of mapping and surveying, including a permanent collection of more than 2,000 pieces and featured exhibits about Washington, Jefferson, Lincoln and Lewis and Clark in addition to its most notable feature Science On A Sphere. 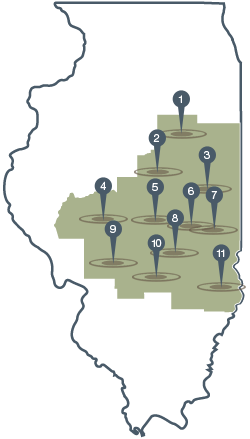 the premier repository for materials relating to the history of Illinois. Once the site of a Union Civil War training camp and Confederate prison, now a cemetery for veterans and their dependents. Designed by Frank Lloyd Wright, the house was built in 1902. It is the most perfectly preserved example of early Wright achitecture, art glass and furniture in the country. to the public include the state dining room, a magnificent library and the Lincoln bedroom. Home to animals native to Australia, Africa, Asia and North & South America. Over 90 species of native and exotic animals are housed here among naturalistic exhibits. Special events are held throughout the year and provide many hands-on experiences for children and adults alike. Also, take a ZooperEdventure with the zoo’s education programs for children ages 2 to 17. Facilities include a gift shop, concessions and petting area. The center of state government, the new Capitol building is the home of the Illinois General Assembly. The museum is committed to collecting, preserving, interpreting and exhibiting the military heritage of the State of Illinois. A“living memorial” to Abraham Lincoln, composed of plants native to Illinois, Indiana and Kentucky. It is on the shores of Lake Springfield. Call for hours. Rollerblade, bike or hike on this five-mile scenic paved trail. The 5th largest carillon in the world and one of the few open to the public, is surrounded by gardens. Birthplace of the native Springfield poet/artist in 1879, it remained his only residence until his death there in 1931. One of central Illinois’ major horticultural attractions. A domed conservatory filled with lush tropical foliage year-round. A globe of the world symbolizing the conflict that involved more than 200 nations. More than 70 stainless steel buttons on the globe signify the major battles and events of World War II. Two black granite walls extend out from the globe approximately 100 feet and are engraved with the major battles and events of World War II.